Without a doubt, wrinkles are among the most annoying thing that can befall your clothing. After all, you don’t want wrinkles showing up on your face – so why on earth would you be happy to see them on your dress shirts, slacks or underwear? Simply put, you wouldn’t and you don’t, but we know as well as you do that – to a certain extent, at least – wrinkles are an unavoidable part of the laundry process. This issue is even more pressing for those dealing with linens in a commercial setting. Whether as house cleaners, restaurant owners or proprietors of hotels, bed sheets, tablecloths, napkins, curtains and similar items need to be ironed in an efficient and reliable fashion. As such, you have to put in the extra time to iron any sensitive garments that are prone to suffering from wrinkles when you’re washing and drying your clothes. If you choose to use one of the more traditional handheld irons, this can be something of a time-consuming process, and in today’s insanely fast-paced world, who necessarily has the time to delicately iron everything by hand? You can’t rush, as that’s a good way to awkwardly miss some wrinkles or end up doing a job that’s just plain shoddy. Fortunately, we live in a time where you don’t have to limit yourself to a classic hand iron. Rotary irons will do most of the arduous work for you, so you won’t need to go over each garment with the appliance by hand. If you’re interested in this alternative ironing options, you’ll want to familiarize yourself with the basics of these machines and also learn about certain high-profile models. These appliances work fairly simply – you feed your sheets through them almost as if you were placing something on a conveyor belt. They are free-standing, essentially fusing the traditional iron and old-fashioned ironing board and fitting easily in your laundry room alongside your washer and dryer. Additionally, most models are heavy-duty enough to be used in commercial applications – they can tackle just about anything you need to put through them. Rotary irons allow you to customize how you iron in a number of ways, including switching up the roller speeds and other settings. Two models in particular will be important for you to look at – the Miele B990E and HM1680. Check out some out their specifications and features below. As a manufacturer, Miele has a long and distinctive reputation for designing reliable, top of the line vacuum and laundry accessories. The Miele B990E Touchtronic Series rotary iron offers further evidence of the company’s production acumen, boasting features that make it come in handy in a number of different ironing situations while still being notably easy to use. This iron will be ideal whether you’re looking to iron your dress clothes or take care of big items like tablecloths and bed sheets. 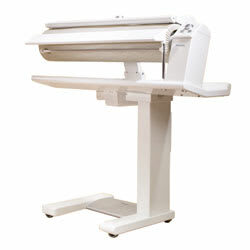 Its wide width – 34 inches – means that you have plenty of space to lay garments out when sending them through the machine. It uses a foot pedal for operation, along with switches to vary the speed as necessary or go back and forth between the three temperature settings. The latter feature is particularly notable, making the iron ideal for synthetics, woolens, silks, cottons, linens and everything in between. Additionally, the B990E has aspects that make the whole laundry process easier, including a bar attachment for hanging garments, a finger guard, emergency release and fold-up design for quick storage. The Miele HM1680 most prominently differs from the model described above due to the use of steam. Combined with its continuous feed mechanism, that feature makes the rotary iron even more useful that it would ordinarily be. As it runs on 220 volts of current, it is quite powerful and thus may be somewhat more well-suited to commercial uses – those who do professional house cleaning, for example – than the B990E. This model has a wide range of temperature settings – cool, warm, hot and everything in between – and you can vary between steam and no-steam ironing. Purchasing a rotary iron is a considerable investment. It’s natural to want to protect it, and you can do that properly by availing yourself of a manufacturer’s warranty from Miele. It’s available for both of the models above, and as long as you live within 50 miles of any authorized Miele servicer, you can receive on-site service for a five-year period.